It's official. Spring swooped in and landed with full force. Yes, Poor Richard and his Almanac would disagree and remind me that March 20 was the official first day of spring. As any gardener knows, spring arrives with a ritual. The Tasting of the Strawberries. Honestly, what heralds spring more than the first scent of newly picked, perfectly ripened strawberries? It's edible aromatherapy. I treat the first berries of the season as if I'm a pretentious vintner. Immediately after plucking the first, perfect fruit from its stem, I hold it close and inhale...banishing winter memories and infusing the stale, recycled air with sweetness.
.) Last year, however, we planted strawberries throughout our gardens—outlining the quadrants of the potager, as well as the kids' raised bed garden. This year, the plants are full and lush with blooms...and now, fruit. My family can't get enough strawberries. So, in addition to the gardens, we have fraise des bois—tiny alpine strawberries—in pots by the driveway. The kids pick them and eat them when they are playing outside. Then, instead of filling a plastic bag with plastic toys for Kristen's birthday party favor, she and her girlfriends decorated terra cotta pots—and planted strawberries in them. And remember a few weeks ago, when Mikey and I created strawberry balls? Well, guess what is producing gorgeous, uber-sweet fruit—right outside our front door? It's seriously addictive. Strawberry plants are taking over the landscape. Honestly, though—why not? The foliage is lovely—and evergreen. The tiny flowers are adorable. Plus fresh, organic snacks just waiting to be plucked are the perfect enticement for kids to eat something healthy—without needing to stop their outside play. And they're perennial. But—and here's where I get hypocritical—I still get berries from our local strawberry farm. And I haven't asked what they use on their crops. What I do know is—they grew organic sweet corn last year that they couldn't sell to anyone but me, because corn is darn tough to grow organically. Without spraying, you'll find caterpillars along with your kernels—a little protein bonus. I'm just nutty enough that I'm thrilled with organic, super-sweet, delicious, fresh-from-the-field corn...and can deal with cutting off the tip of the previously caterpillar-nibbled ear. In fact, after they warned me that the corn wasn't sprayed, and I'd probably find some caterpillars, they were shocked when I snagged five dozen ears. They told me that every customer interested in corn walked away when told it had not been sprayed for caterpillars. Grown men ran for their cars, disgusted by the corn worms. But I digress...it's not corn season. We're talking strawberries. And commercial strawberries. And I think the point I was trying to make is—if you know your local grower, you can also know about his or her growing philosophy...and you can make informed decisions about whether organically raised strawberries are important to you, or whether conventional practices are good enough so that you can enjoy a beautiful day of strawberry picking with your family. A friend sent me an e-mail. She had a refrigerator full of strawberries, ready for eating and freezing...and then read about California's allowance of methyl iodide for use on strawberries. She did some research and discovered it's also approved for use in South Carolina. She asked at the farm if the strawberries were organic, got some vague response (which neither of us could decipher), and then worried that she shouldn't feed the berries to her kids. My response? 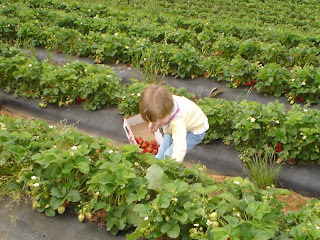 My kids and I have been eating just-picked strawberries in fields probably full of pesticides and herbicides for years. YEARS. And everyone is alive and well. To me, the real risk involves the field workers who are inhaling/absorbing the chemicals through their skin. That's what we need to be taking a stand against. And yes, I love that we have our own organic strawberries in our gardens. But—I also love those memories of picking strawberries at farms with my children. I'm sure someone will take me to task for endangering my children's lives through non-organic strawberry picking. If that's the worst thing I do as a mother, well then—I'm clearing space on the mantle for my “Mother of the Year” trophy. Strawberry picking is a very exacting art, particularly if it involves small children. First, make certain each child has his or her own basket. Trust me. Avoid combining the contents of the baskets, because this will cause much anxiety over whose berries belong to whom. Somehow—they know. And they only want to eat the ones that they picked themselves. Next, teach the kids to step over the rows, not on the rows...and remind them that they do not get bonus points for berry-smushing. After the rules of “only pick red berries” and “do not play in the fire ant hill” are firmly reviewed, it's time for the ritual tasting. Each picker plucks a large, perfectly ripened, sun-warmed strawberry. On the count of three, bite it. Remember to pick up Zout on the way home. As you weave your way through the rows, searching for the perfect berry, remember that for every berry that makes it into the basket, two berries are eaten in the field. This is important to remember, because tummy aches do not make for a fun outing. At some point, particularly if you have younger children, they will foist their baskets upon you. You will find yourself with three gallon-containers that are only partially filled. You will feel an overwhelming compulsion to fill each container to overflowing while you try to keep the kids from berry-squishing. Soon, your sticky, muddy, sweaty cherubs' excited voices will turn to whines, while you tell them, “One second...just one more.” Finally, hateful looks from other berry-picking mommies will let you know that it's time to pay up and head out before your babes succumb to heat exhaustion. Blend strawberries and milk together until smooth. Remind children that the lid of the blender must be firmly secured before hitting the “blend” button. Add ice cream and blend again until smooth. Makes 4 8-ounce milkshakes. Cheers to spring, to strawberries, and to the beginning of a lovely growing season!